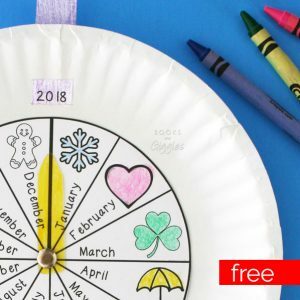 Inside: This engaging months of the year activity includes a free printable, plus additional resources to help you teach your kids the individual months as well as the concept of 12 months in a year. With a new year starting, I’ve been reflecting on last year and looking ahead to the coming one. 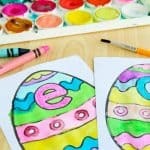 My girls are getting too old for preschool and even kindergarten crafts, but I still like to make them to share here. 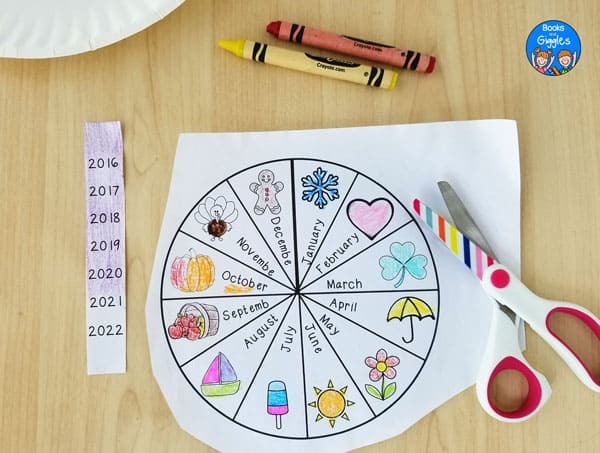 This craft and activity for learning the months of the year actually did catch their interest. 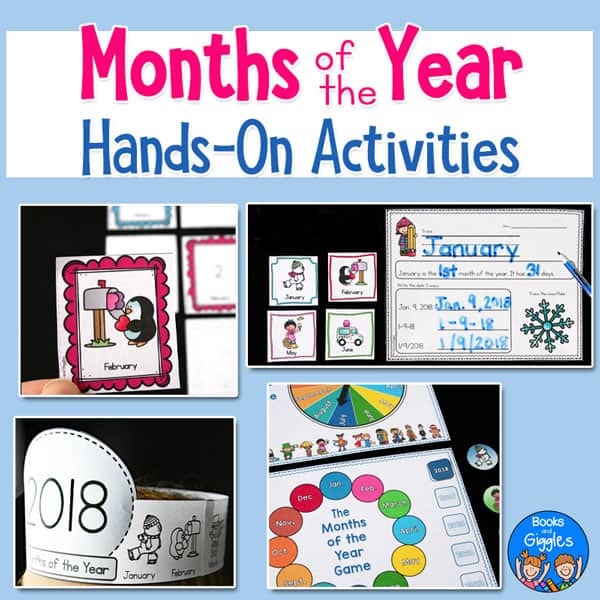 They already know their months of the year, both by memory and as sight words. Yet, they love anything interactive, and anything they can color. They were happy to get their hands on this. 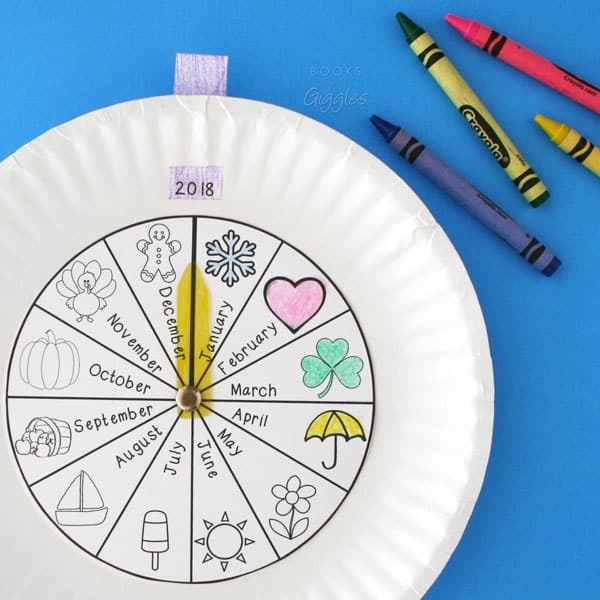 This months of the year activity is super easy because I’ve made up a free printable for you. Really, all you have to do it cut and glue it on, an add a couple of interactive features to make it fun. The pointer spins around, and the year slides up and down. So you can show your kids how, as you move from December to January, you change the year. 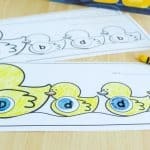 To download the free, perfectly sized printable template, just click the blue Books and Giggles button at the very end of this post. Color both parts of the printout, and then cut them out. 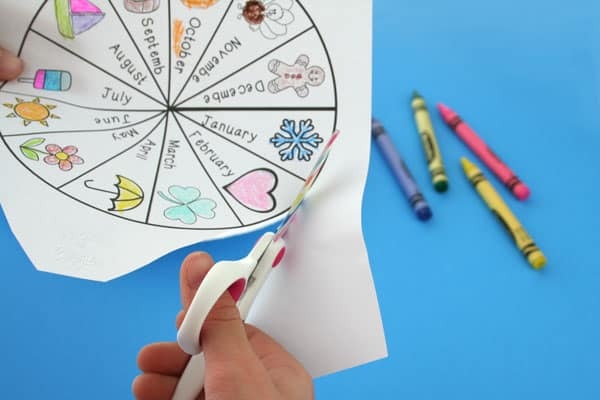 Glue the circle cutout onto the paper plate. Cut out a plastic pointer from your clear plastic (the cut plastic can get sharp until you round the corners, so be careful). Color one side of the pointer with yellow (or another light color) permanent marker. Punch a hole in the plastic pointer. Attach it to the paper plate with a paper fastener. Cut 2 slits in the top of the paper plate wide enough for the year strip. Weave the paper through the slits. 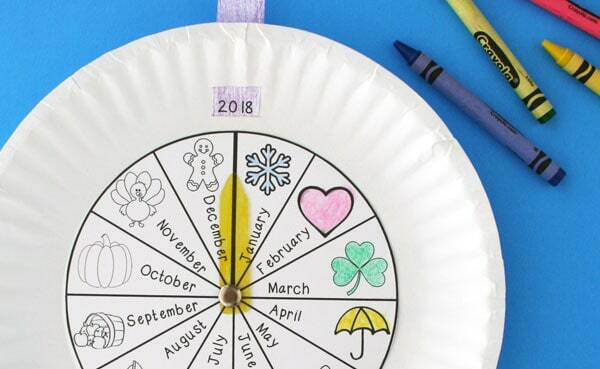 Your kids will love spinning the month arrow around and around, and changing the year every January. Oh my word! I’m in love with the ones I found! 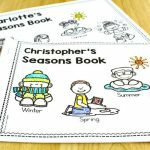 They’re all perfect for teaching poetry as well as for reinforcing the months of the year. 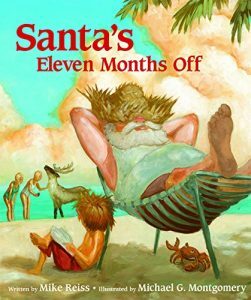 Santa’s Eleven Months Off is a fun new book about what Santa does the rest of the year. There’s a poem for each month. 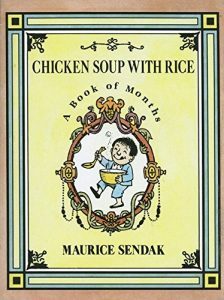 Chicken Soup With Rice by Maurice Sendak (of Where the Wild Things Are fame) is a classic. This one also has a fun poem for each month of the year. I may get several of these stuck in my head next. 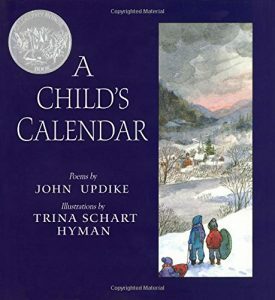 A Child’s Calendar by John Updike is simply gorgeous. There’s a lovely poem for each month, and beautiful watercolor pictures on each page spread. This was a Caldecott Honor book. RELATED: Here are 12 more books about the months of the year. This is one of my very favorite book lists! I’ve tried on 2 different devices and the download will not work. It states that the server cannot be contacted and then after I’ve tried a few times, it says I’ve downloaded too many times. Can you please email the PDF to me? Thank you! My students loved it !! They’ve been singing the song every day if January and this seemed like such a perfect tie-in. They can’t wait to show them to their families! The link for this does not work. I received it and it says it is expired. Bummer! 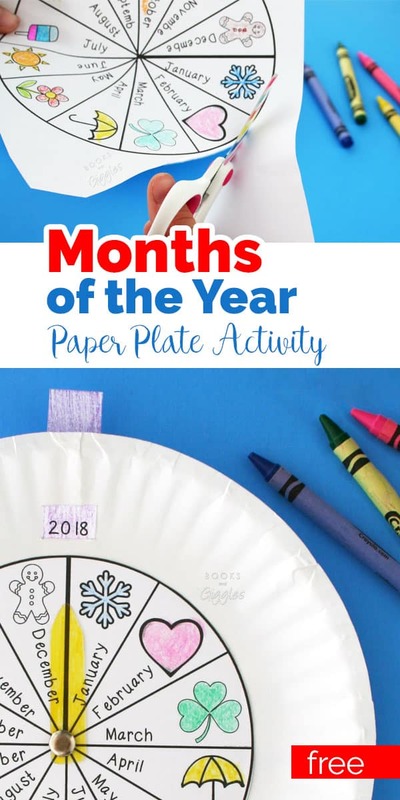 Fun and easy way to teach kids months. I love this to reinforce the months with my kinders! Unfortunately, the download didn’t work for me either. Any suggestions? It should be working fine now – did you check your spam folder? I don’t see the link to download the printable. Sorry you were confused. Read the paragraph right below the photo with scissors cutting out the printable. Once you fill in your info, you’ll need to check your email inbox (and maybe your spam folder) for the link to the file. Check your spam folder. Let me know if it’s still giving you trouble. I’ve tried several times to fill it out and have emailed to me, but it’s not coming through. It’s not in my junk box. Can you please help me out by sending it? I’m so sorry! I emailed you. I also just tested it here, and it seems to be working fine now. I’m so sorry you’re having trouble. I just checked it, and it seems to be working fine here, and I can see that other people have downloaded it today. Is it possible you skipped the “I’m not a robot” part? Hope you can get it to work for you! My daughter will adore this. Still having downloading issues. I enter my email, but nothing happens! I’m so sorry! I’m working to resolve the problem quickly. Meanwhile, I emailed it to you so you don’t have to wait.